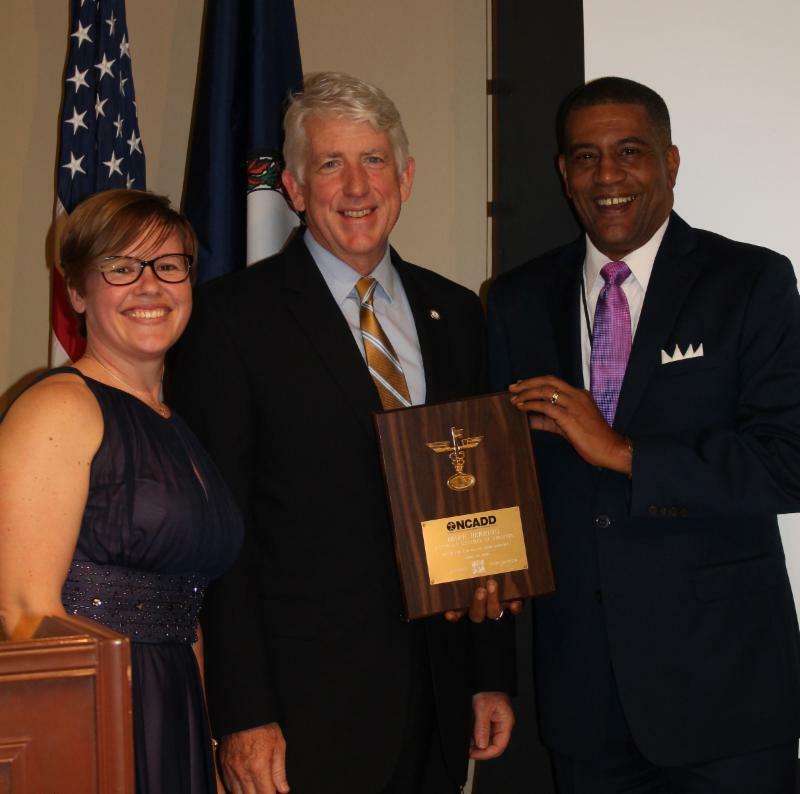 RICHMOND (April 26, 2016)- Last evening, Attorney General Mark R. Herring was recognized with the Bronze Key award from the McShin Foundation for his ongoing efforts to combat heroin and prescription opioid abuse in Virginia. The Bronze Key is a national recognition award presented by affiliates of the National Council on Alcoholism and Drug Dependence that recognizes outstanding contributions to the field. Addressing a group of 125 supporters and members of the McShin Foundation recovery community at its 12th Annual Spring Awards Banquet, Herring accepted the award "on behalf of a great team at the Office of the Attorney General who are working tirelessly to help address this opioid epidemic, as well as the many families and advocates who have worked with us on these initiatives." "So many families across Virginia have been touched by addiction to heroin and prescription opioids, and too many have already lost a loved one to a fatal overdose," said Attorney General Herring. "In response, we have developed and are implementing a strategy that includes every tool we have at our disposal, including prevention, education, and treatment, alongside enforcement against dealers, traffickers, and those who profit off addiction. It also recognizes that, in many cases, this is a problem that has its roots in the medicine cabinet, not in the streets, and that the medical community has to be part of the solution." "Last night's Spring Awards Banquet was one of the best we have ever had," said Honesty Liller, CEO of the McShin Foundation. "A huge thank you to Attorney General Mark Herring for all of the support for the recovery community. It amazes me how much he has done in our community for those with a Substance Use Disorder and their families. We are all in this together to better the lives of the citizens of Virginia!" Attorney General Herring has made combating the heroin and prescription opioid epidemic a top priority, attacking the problem with a multifaceted approach that includes enforcement, education, prevention, and legislation to encourage reporting of overdoses in progress, expand the availability of naloxone, and expand access to the Prescription Monitoring Program. His office has also created a documentary called "Heroin: The Hardest Hit" which features Virginians, including staff and participants from the McShin Foundation, sharing their own stories of addiction, overdose, and recovery. It also includes stories of young people who lost their lives to a fatal heroin overdose, and it has been viewed nearly 50,000 times. In the last year and a half, Attorney General Herring and his team have worked with local and federal partners to prosecute more than 28 cases against dealers and traffickers involving more than 95 kilograms of heroin, or approximately 238,500 daily doses, with an estimated street value of more than $19 million. "So often, shame, stigma, or fear forces families and those with substance abuse disorders to suffer in silence. But we cannot and will not let ourselves become hopeless or discouraged. We have to make sure that people who are struggling know you can beat addiction. There is life after addiction, and there is hope in recovery. That is what the community at McShin, and others around the state, have taught me," said Herring.